$.75 per pound for Westmoreland Cleanways and Recycling members (current members only; memberships will not be offered at the event. For membership information, visit our Membership page or call 724-879-4020). *DISCLAIMER: Westmoreland Cleanways and Recycling cannot be responsible if our contracted vendor will not accept certain materials. Pre-registration required: Call 1-866-815-0016, or visit www.ecsr.net to register. Pack your vehicle and head to the event. Household Hazardous Waste is waste produced in our households that are hazardous in nature, but are not regulated as hazardous waste under federal and state laws. Each person in Pennsylvania produces an average of four pounds of HHW each year, for a total of about 25,000 tons/yr. statewide. If carelessly managed, these consumer waste products can create environmental and public health hazards. HHW is that portion of a household product that is no longer usable, is left-over or unwanted, and has to be disposed of. The labels on hazardous products typically use words like CAUTION, WARNING, POISON, or FLAMMABLE. Auto/Garage: car wax, starter fluid, solvent-based cleaners, antifreeze, repair products, brake fluid, motor oil, gasoline. Home Improvement and Household Supplies: oil based stains and paints, caulking, varnish, paint thinners, chemical strippers, flea collars and sprays, insect repellents, insecticides, kerosene, lighter fluid, lye, mothballs, pool chemicals. Personal Care Products: nail polish and remover, lotions and crèmes, hair color, and mercury thermometers. Pharmaceuticals and Sharps: Over-the-counter and prescription drugs; needles, syringes, sharps. Call Westmoreland Cleanways at 724-879-4020 for proper disposal options. 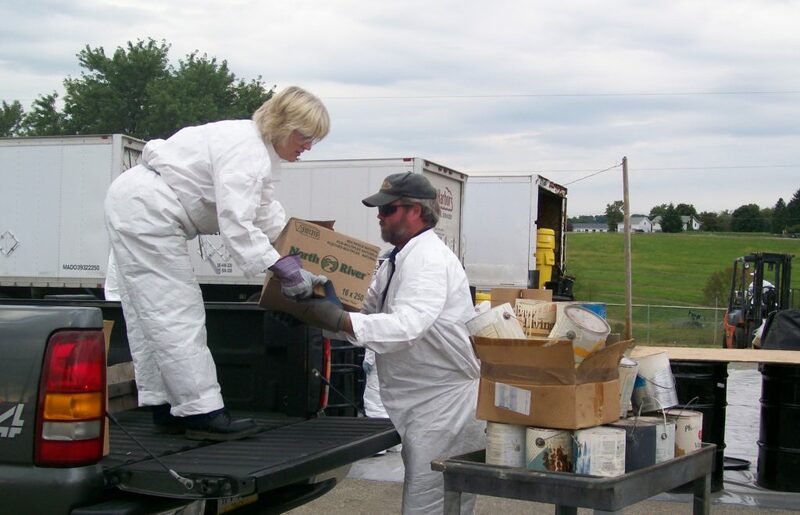 Attend a Household Hazardous Waste Collection Event. Residents of some Westmoreland County municipalities have the option to recycle their HHW curbside through their garbage hauler. The service is built into the trash/recycling contract; however, additional fees may apply, and certain materials may be restricted. Where available, it is necessary to contact the hauler to SCHEDULE the service. Keeping painting-What better place to put that last pint or so of paint but right up there on the wall where it blends in perfectly with all the other paint you just put up there. Paint something else- Use an old piece of cardboard, some scrap lumber, or the inside of your garage. Just about anywhere would probably work to use up that last bit of paint. Save it for later- many people have saved paint that becomes unusable over time. To prevent this from happening, cover the opening with plastic wrap, replace the lid, making sure the lid fits securely so the paint doesn’t leak. Then turn the paint can upside down! This creates a tight seal, and keeps the paint fresh to use again. Let the paint dry out- Pour the paint over an absorbent substance such as clay-based cat litter or shredded newspaper. Let the cat litter or newspaper dry, put it in a plastic bag and throw it away. Or purchase a paint hardener from a local paint retailer. Many such products are a powder which is poured directly in the paint. Once the paint hardens it can be thrown away with your normal trash. Buying an extra gallon of paint is not a bargain if half the gallon must be disposed of. Only buy what is necessary for the job. Calculate the amount of paint needed for a job with the help of our Paint Disposal Flier. Some materials may no longer be in their original container, may or may not have a legible label, and/or be very old. The material may no longer be manufactured, may be illegal to possess or use, or be intended primarily for use by business and industry. These unusual materials warrant extra care in handling and disposal. If you are unsure of what a material is, if the container is stable, leave it in the container it is in until it is to be transported to a HHW collection. If the package is unstable (corroded metal can, torn bag), decide the best way to encapsulate the material (glass container or heavy mil plastic). Wear chemical-proof gloves, long pants and long sleeves, and breathing mask. Ventilate the area, being sure to be upwind of a breeze or draft; but DON’T use a fan around powders. Encapsulate the material and store it where it can be undisturbed until it can be transported to a HHW collection. Wash well, and remove and wash clothing after handling any HHW product. The best method of managing Household Hazardous Waste (HHW) is to prevent its generation in the first place. This involves selecting the least toxic item “to do the job” and buying only the minimum amounts necessary. Download a list of safer alternative household products here. Buying in large quantities is not a bargain if half goes unused and must be discarded. If the material is still usable (e.g. undamaged, still within designated shelf life), check with friends and neighbors to see if they can use it. You can also check with your local solid waste or recycling office for suggestions. Cleanup of broken CFLs is very different than old practices with incandescents. CFLs contain a small amount of mercury sealed in the glass tubing. When broken, some of the mercury is released as mercury vapor. The EPA stresses that the bulb will continue to leak mercury vapor until it is cleaned up and removed from the home. To minimize exposure, the EPA recommends homeowners clear the room of people and pets, and then open a window or door to the outdoors for 10 minutes. Central heating and cooling systems should be turned off as well. For detailed information on proper CFL disposal, check out the full EPA update.